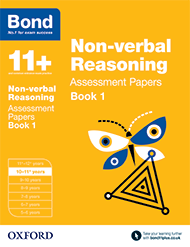 Find out more about the 11+ non-verbal reasoning exam (referred to as 'spatial awareness' in some local authorities or schools) and how Bond 11+ non-verbal reasoning resources can support your child on their path to exam success. 11+ non-verbal reasoning/spatial awareness is often used as a neutral way of testing aptitude levels in children. It does not require any prior knowledge and can be used to determine a candidate's potential to think logically and recognise patterns. Non-verbal reasoning/spatial awareness is not part of the National Curriculum in state primary schools, and this style of assessment may feel quite strange for children who have not seen questions framed in this way before. This is why practising these kinds of questions at home is so important: it helps familiarise children with a style of testing that they won’t experience at school. The scope and content of an 11+ non-verbal reasoning/spatial awareness exam differs from region to region as there are a wide range of question types that can be included. In addition, it is important to establish if non-verbal reasoning/spatial awareness is tested by the Local Authority (LA) that administers the 11+ in your area, as not every LA tests this subject. 11+ non-verbal reasoning/spatial awareness exam papers are timed and usually last between 45-60 minutes. Children should practise with timed 11+ mock test papers, as well as working through non-timed practice, so they can see what they are able to do within a given time frame. Non-verbal reasoning/spatial awareness is not taught as part of the National Curriculum in state schools so it’s important to practise these kinds of questions at home. This will build your child’s confidence and help familiarise them with a style of testing that they won’t experience at school. Here are some ideas for you to try at home in order to help your child prepare for their non-verbal reasoning/spatial awareness 11+ exam.